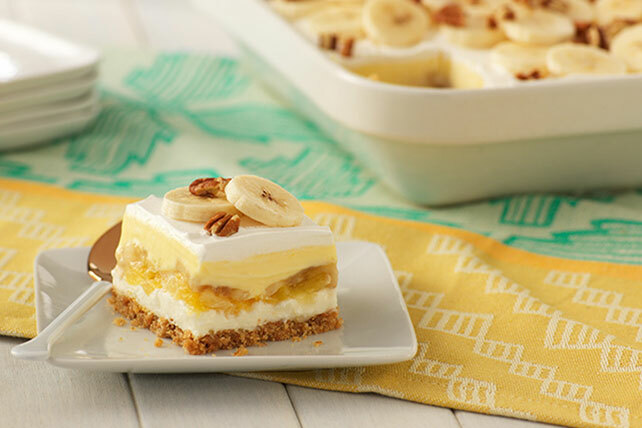 Go bananas with this sweet and delicious Banana Split "Cake" from Kraft. Find out how to turn your favorite ice cream dish into a delightful "cake". Combine graham crumbs, 1/4 cup sugar and butter; press onto bottom of 13x9-inch pan. Freeze 10 min. Beat cream cheese and remaining sugar with mixer until blended. Spread carefully over crust; top with pineapple. Slice 4 bananas; arrange over pineapple. Beat pudding mixes and milk with whisk 2 min. Stir in 1 cup COOL WHIP; spread over banana layer in pan. Top with remaining COOL WHIP. Refrigerate 5 hours. Slice remaining bananas just before serving; arrange over dessert. Top with nuts. Omit nuts. Make chocolate curls from 1 oz. BAKER'S Semi-Sweet Chocolate. Use to garnish dessert. Substitute 1-1/2 cups graham cracker crumbs for the crushed grahams.